Here's the irony. When I was a student at VCU in the early (really early) 90s, studying politics and culture, Brandon Fox was my favorite waitress at the Village Cafe. It would be a stretch to suggest the Village Cafe in the early 90s was a place to study food, but bear with me. Today, Brandon has a weblog where she issues forth on all things food (not frequently enough -- when are those girls going back to school!?) and I have a weblog where I blather forth on all things politics (and some things culture). 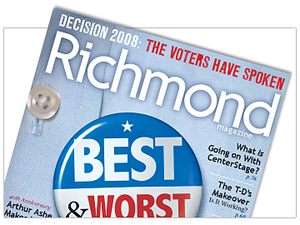 And we've just been voted the weblog equivalent of Prom King and Prom Queen by the readers of Richmond Magazine. Full circle, in a mildly non-linear way. John Sarvay said he'd take a break when he and his wife had a baby this year, but it didn't take long for him to return to blogging. At Buttermilk and Molasses (one of four blogs he maintains regularly, including North Richmond News, his personal blog Garden of Words and an internal blog for Luck Stone), Sarvay offers up a mix of political musings, pop-cultural observations and a much-needed focus on our community, all of which compelled us to name him one of the media's pleasures in last year's Best & Worst issue. This time, the magazine's readers have wisely followed suit. The baby is fine. She's currently sound asleep next to me, looking gorgeous. I managed to avoid Buttermilk & Molasses from March 31 through April 24. I work full-time in leadership development for Luck Stone Corporation. I blog on the side. And cut the grass, cook and walk the dog. My wife's blog is more interesting than mine. The internal blog is on an interesting platform called Twine. I'm not sure if I like it. I may be popular, but I still can't beat Richmond's all-powerful weblog duo (see #75) in a virtual Texas Cage Match.